What are Premium Link Generator / Rapidleech? 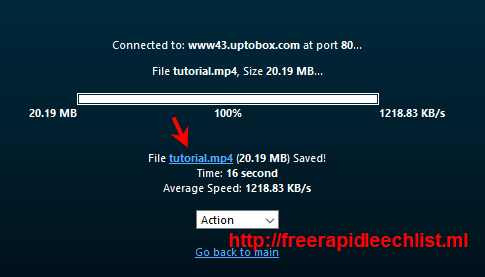 Premium Link Generator / Rapidleech allow you to download files instantly and at the best of your internet speed. It is your personal proxy host protecting your real IP (no more country blocking) to download files hosted on various file hosts. Premium accounts are added to these generators so they can transfer files from file hosts without limit via fast servers connection speed and dump the files on their server. You can then download these files from the server to your device later on using browser or download tool like IDM etc which support resume download. 2) When the download complete, your filename will appear below (where arrow is pointed). Just right click to 'Save target as' or copy the link to download manager like IDM. Some Premium Link Generator / Rapidleech contain ads and you need to go through ad/ads in order to get your actual download link.